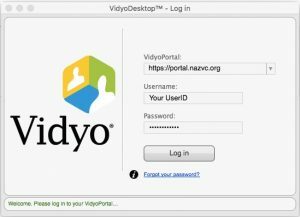 To log in to the Vidyo Conference service please run the VidyoDesktop program that is installed on your computer. Start the program and select the login option. You will see the panel shown below. NOTICE the portal address that is required is shown here. Enter you username and password then select ‘Log In’.